Third Taxing District electors vote on their budget Wednesday in The Marvin, including TTD Commissioner Charlie Yost, left, and Common Councilwoman Michelle Maggio, who was elected to run the meeting. Maggio voted against herself. Updated, 6:18 p.m., clarification about objections to the library master plan; Correction, 4:23 p.m.: Michael Intrieri is TTD Treasurer. East Norwalk Association President Sarah Mann. There’s “peace in the kingdom now,” East Norwalk Association President Sarah Mann said Wednesday evening, as the Third Taxing District prepared to begin its annual meeting with its electors to authorize its budget. 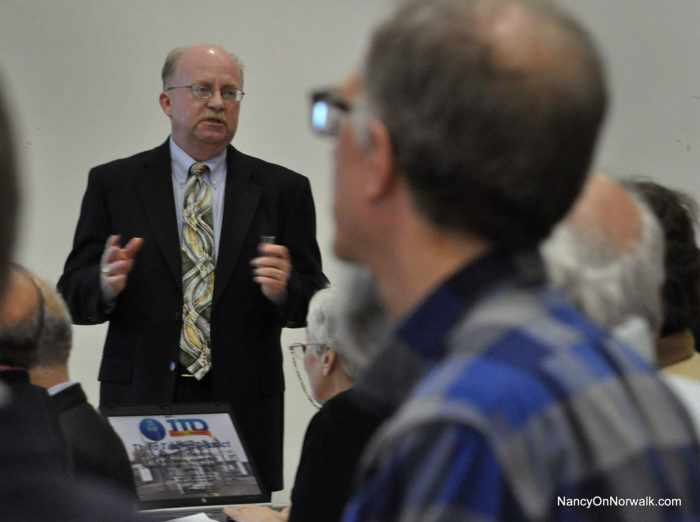 You may recall, over the past couple of years then-East Norwalk Association Executive Director Stan Siegel was not happy with TTD’s effort to create a library master plan, with the help of a $20,000 consultant. 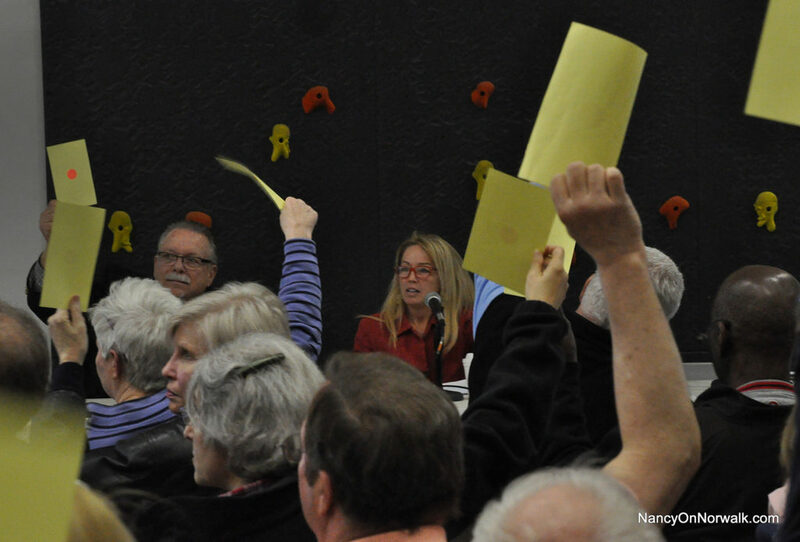 Mann and other members of the Library Planning Committee were also opposed, waging a battle during a series of contentious public meetings. Nevertheless, a plan was completed, and, “This past year, the East Norwalk Library Board began to put that plan into motion. It was determined that the roll out was not successful and a change in leadership was necessary. The change has been accomplished,” Mann told TTD electors, who went on to unanimously approve a TTD budget that has a new entry – a planned $60,000 salary for a full-time library director. “After much soul searching, we decided that in order to see our mission come to fruition we needed for the first time in the library’s history a director with a master’s in library science,” Mann told the electors, before the vote. Siegel wasn’t at the meeting. The salary, a bump-up from Siegel’s $27,780 for part time work, is “pretty much the low end,” but thought to be fair as the library is small, with a staff of four, Mann said. Library maintenance was also increased from $500 a year to $3,000, with a plan to put blinds on two window, possibly in the children’s room. The major project for the library is fund raising as, “We cannot continue to get funded through the TTD exclusively,” Mann said. Most electors were quiet, but Diane Cece asked a series of questions about the budget, zeroing in the increase and asking what the plans were for lesson the burden on TTD ratepayers. Cece asked if there was a five year projected plan. Cece asked that fundraising be part of the plan, and said the ratepayers were expecting that years ago. An appeal was made for new ENA Board members, with Mann calling it a “convivial Board.” Commissioner Charlie Yost asked that anyone with expertise in fundraising step forward to help. It’s been a project for six months to a year, TTD General Manager James Smith said Wednesday to ratepayers – he’s worked out a deal for TTD to be the back-up supplier of electricity to the SoNo Collection, the mall GGP plans to build on West Avenue at the intersection with Interstate 95. Third Taxing District General Manager James Smith speaks to ratepayers Wednesday in The Marvin. South Norwalk Electric and Water (SNEW) is the primary supplier but, “Why should SNEW have all the fun?” Smith said. If SNEW went down, “The mall is out so if you are in the elevator at Bloomingdale’s you are stuck,” Smith said. Answering questions from the audience, Smith said the projected load is about 8 megawatts and a cable will be installed from TTD to the mall, going up Fort Point Street and then under the Norwalk River where the wastewater treatment plant is. The price tag on that is $2 to 2.5 million, he said. Retired TTD employee Pete Johnson said that the cable will be on a different circuit from SNEW’s line, so there’s no possibility that they’ll both go out at the same time. The conversation ended with a quip. “Take the stairs,” Commissioner David Brown said. The tension over new school construction extends back in time, with repeated commentary about former Mayor Richard Moccia as Board of Education member Mike Barbis and former Common Council member Nora King have in multiple venues spoken of the lack of air conditioning at Rowayton Elementary School. Barbis mentioned it at last week’s Democratic Town Committee meeting, and before that, it came up at the Jan. 26 joint meeting of the Common Council Planning Committee and the Planning Commission to review the 2017-18 capital budget. The schools are moving toward summer learning, as it’s pegged as 50 percent of the reason for the achievement gap, Superintendent of Schools Steven Adamowski said, during the discussion. There’s no funding for air conditioning in the schools, Planning Commission Chairwoman Frances DiMeglio observed. Only half of Norwalk’s schools have air conditioning and if they do they don’t have sufficient units to cool the entire building, Adamowski said, adding that on a hot day it might be 80 degrees on the first floor and 90 degrees on the second. It’s a renovation issue, as you also need to upgrade the electrical wiring to be able to handle air conditioning, he said. City Hall is air conditioned by it’s expected that teachers and students will swelter and be able to function, DiMeglio said. Moccia was “vehemently opposed” to air conditioning schools, Barbis said. “I was on the committee for Rowayton School,” Barbis said, referring to a recent addition at the school. “We had a huge fight, where we begged to have air conditioning and the city’s policy at that time was against air conditioning schools. There was a whole series of arguments. That was “everything about maintenance to how long a school year was open,” with then-Superintendent of Schools Susan Marks offering the information that most schools are open year-round, he said. Last year, 18 of Norwalk’s 19 schools were open through the summer, Barbis said. Do you go to a doctor? The school construction issue was a topic at that DTC meeting, where Morris argued that good Democrats don’t make nasty comments about other Democrats on Facebook. “When you put together the plan do you not include people from that community, to be at the table, to give input?” NAACP President Brenda Penn-Williams asked Barbis, forcing him to explain, yet again, the process by which the BoE developed its plan to build two new schools as the first step to addressing overcrowding and dilapidated conditions. “It’s for an expert to tell me what I should do? That’s what you’re saying,” Penn-Williams said. Barbis asked her if she goes to a doctor when she’s sick, or to a lawyer when she has a legal problem. “Everyone has a different way of doing things. A lot of people do,” Barbis replied. The District B Democrats meeting scheduled for tonight, March 9, is a go, even if a group of parents on Wednesday wrote to District B Chairman Bruce Morris and asked for a different date. BoE member Erik Anderson is going to field questions about the BoE’s plan to build new schools, but Brookside Elementary School Parent Teacher Organization (PTO) leader Shiloh Martin-Adam, Jefferson Elementary PTO leaders Julie Tiano-Signore and Matt Yost and the Columbus Magnet School Parent Teacher Association (PTA) say there are conflicts that will keep parents away. Morris has criticized the BoE for its schedule of South Norwalk meetings in regard to its strategic operating plan, where the possibility of a new school was discussed, complaining that they weren’t held at times when residents could attend, although one was held on a Saturday morning and others were held on weekday evenings. He also states that there were no meetings devoted exclusively to the new school issue. The decision by the current Board of Education not to sign a civility code was made in Dec. 3, 2013, executive session, at the request of BoE member Shirley Mosby. BoE Chairman Mike Lyons had suggested that everyone sign a code identical to the one signed by the previous Board, to “keep the positive momentum going” from Board retreat held that November. “In the exec session, Shirley refused to sign the Code. Since we felt unanimity was important for it to work, we dropped pursuing renewal of it from that point forward,” Lyons said in an email. Norwalk Federation of Teachers leaders recently condemned Lyons for not adhering to the civility code with his comments made on Facebook. Norwalk Branch NAACP leaders subsequently cited the code in its objections to Lyons’ comment about John Mosby, Shirley Mosby’s father, for which they demanded that Lyons resign. Deb Goldstein’s warning to the Zoning Commission on March 1 rang a bell to NancyOnNorwalk, a reminder that Costco challenged its property valuation in 2014. Goldstein warned Zoners that the claims of lucrative property taxes from the big box store proposed for Main Avenue might not come to fruition, as some big box retailers challenge their property valuations, in one case right after the store was built! Google “Dark Store,” Goldstein said. “The Dark Store strategy is a tax loophole being used by Big Box retailers and other national chains to lower the amount they pay in property taxes. Retailers such as Lowe’s, Target, Meijer, Home Depot, and Menards are arguing that the market value of their thriving store should be based on the sales of similar size ‘comparable’ properties that are vacant and abandoned,” states the League of Wisconsin Municipalities, in a post that is top of the list on a Google search. Googling “Connecticut Dark Store” turns up a seemingly promising story at the top of the list – that has only three entries – but it turns out it’s from Milwaukee. Thats where you find that Menard’s built a store at a cost of $10.6 million and then promptly claimed that it was only worth $5.8 million. The phrase “Dark Store” isn’t used, but you get the picture. Anyway, Costco. NoN was poking around the state’s judicial website a few months back and noticed that Costco Wholesale Corporation in 2014 challenged Norwalk’s assessment of its Connecticut Avenue store here. The end result was that the valuation was reduced by $700,000. Assistant Corporation Counsel Brian McCann handled the case. We don’t have a failure to educate. We have a failure in parenting. Don’t ask me to pay for other people’s failure to parent. I was at several of the BOE planning meetings. Did not see Morris at one. He did not have anything to say then. He should be quiet now. Stop trying to make yourself relevant. Thank you to all of the rate-payers who attended the Annual Meeting in Norwalk last night. By my math, that one reval alone would have paid for just over half of the $1.3mm reduction being asked of Dr. Adamowski to help close the gap between the proposed school budget and the one that is likely to be approved. 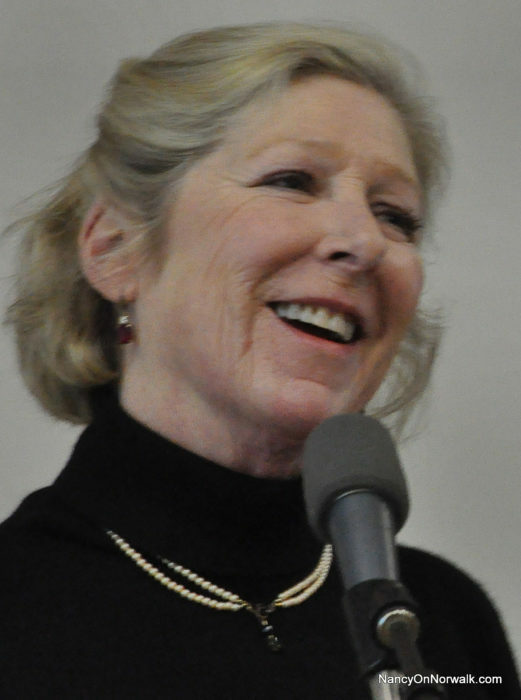 Thank you Deb Goldstein for connecting the dots between Norwalk’s bargain basement box store strategies, business tax assessment challenges or the Redevelopment Agency’s perennial tax credits to developers, all while homeowners and the school system suffer. Debora Goldstein – I see your points, but I’m not sure on the math. I believe the 700k is “assessment” – not tax obligation. As a registered Democrat, who lives in District B, with children at Columbus Magnet School, I’m profoundly disappointed by Mr. Morris’ rejection of the meeting change request by the Columbus, Jefferson and Brookside PTA/PTOs. During this meeting, BOE members were to field questions from the District B Democrats about the BOE Facilities plan. Mr. Morris has repeatedly, and incorrectly, stated that the BOE process has not been transparent and has not provided an opportunity for the public to provide input. Now here we are, attempting to have all stakeholders present for a discussion and he will not accommodate the parents, whose children will be directly affected by the plan. To state that the District B Dems would “never hold a meeting” on the dates of a SNEW budget meeting, but then hold a meeting on the night of 3 school events, is an insult to parents, the schools and the BOE. With all due respect to the SNEW budget process, I have limited time to attend city meetings, and place my kids’ education at the top of my priority list.